What better way to warm up during a bitter cold winter? Well, going somewhere tropical just might be better, but this is a close second (okay, maybe a not-so-close 86th or so). This was a new stew to me, and it was delicious! Heat oil in stew pan over moderate heat. Dredge beef in flour, salt and pepper. Add to pan and brown lightly on each side. Remove to plate. Add garlic, onion and sugar to pan, stirring 1 minute. Deglaze pan with ¼ cup stock. Add remaining stock, water, tomatoes and herbs then bring to a boil. Return beef to pan, reduce to simmer, cover and cook 45 minutes. Add vegetables, cover and cook additional hour or until vegetables are tender. Mary, this sounds very tasty. I’ve got a pot roast simmering in the slow cooker today but will try your stew soon. Thank you! Sometimes, simple is just what’s called for. Warm and soul satsifying, that’s whats needed on a cold night like this (calling for -5F here in Wisconsin tonight). My DH loves beef stew. 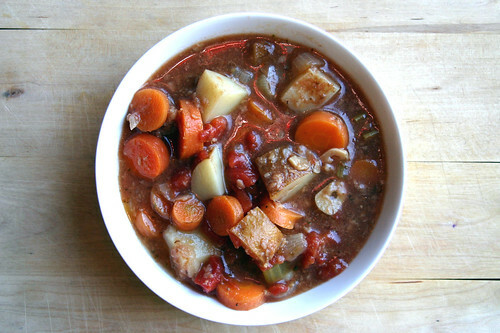 You are so right about beef stew being perfect on a cold winter day. Seems no one, including Floridians, are exempt from the cold winter days. Thanks for sharing the wonderful photo! Mouth-watering and warm – oh so warm. I like warm. I’m ready for summer. Delizioso! It’s a good time of year for a reminder of the essentials like a well-made stew. I love a good stew. I played around with recipes back in October – but maybe it’s time for another batch. Something I might suggest? Next time, try throwing an oxtail or a short rib or two in there – the additional gelatin from those bones adds SO much richness to your stew. It’s amazing. wow beef stew! i love this dish! =) im such a tomato based dish fan!! This looks so good! I’ll have to try it on a “meat-eating” day! this is what I call a nice bowl of comfort! Mmm. Looks hearty and my type of comfort food. May just have to have this for dinner tomorrow! Oh, Katy, this looks wonderful! It’s even cool down here in Roatan. 70 degrees. Can you believe it????????? ?